Research Allowances are one of the special allowances that are given to the government employees. This type of special allowance is given to encourage the people who want to pursuit their academic research in specific fields. Research allowances are given to the people associated with any profession that needs higher academic research. Especially doctors get special allowance for their further research or thesis. There are some changes that have taken into consideration under 7th pay commission. Here I will discuss about the research allowance. As mentioned Research Allowance is a special allowance for the government employees who want to proceed further for the research work in their professional fields. This special type of allowance is provided to encourage the academic research on specific fields and enhance the performance of the researcher. This Research Allowance can be received before the research work or applicants can reimburse the amount as well. The allowance is paid in two categories, personal research or official research. The research work can be on any field related to medical, teaching or any other field. The research allowance can be reimbursed after the research work; there is no upper limit of this allowance. Doctors who have MBBS degree and working under any government medical centre on a monthly salary basis are eligible for this research allowances. If any doctor wants to pursuit higher research can reimburse the cost of research. If the allowance set at Rs. 4000/- for him/her then he/she can reimburse the entire amount which will be fully exempted from income tax. 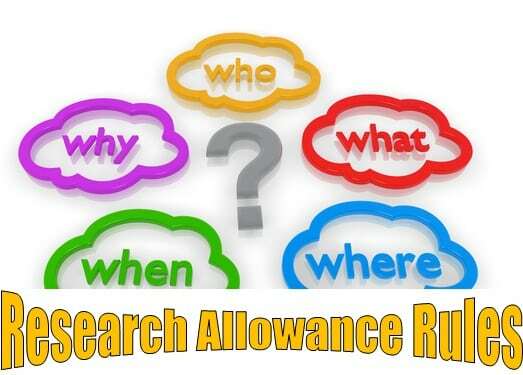 Research allowance is considered to be a special allowance given to the government employees. This allowance falls under the section 10(14) of Income Tax Act. According to the rule, the research allowance is fully exempted from the income tax if the reimbursement amount is lower or equal to the desired amount. If the cost of research exceeds that specific amount, then the applicant might have to pay tax on the rest amount. Research Allowance is not fully exempted from the income tax. A certain portion lower or equal to the amount of the allowance is however not falling under any income tax slab. Under section 10 (14), mentioned certain part of the allowance used in official research purpose is being fully exempted from the tax. However the rest part will be taxed according to the income tax law. The qualification grant is abolished as a separate allowance. It is added to the higher academic study allowance.